I love #specialteams! 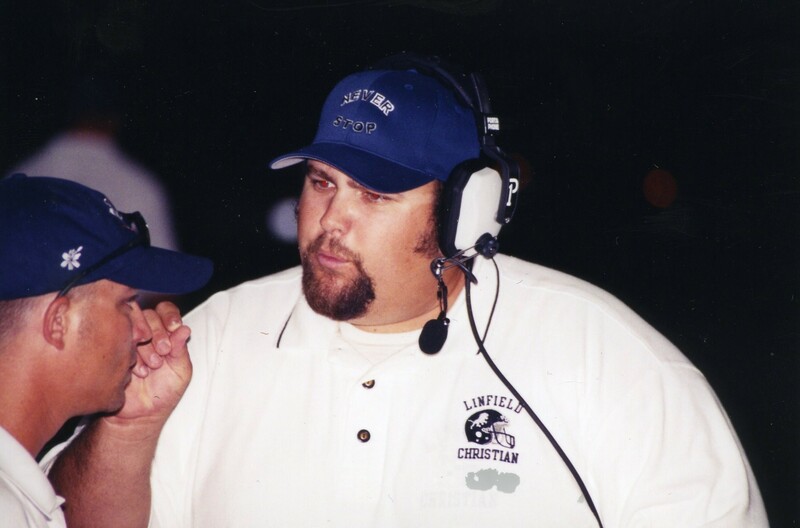 I have been a Special Teams Coordinator for 11 years, longer than the 8 years that I have been a Head Football Coach here in Southern California. 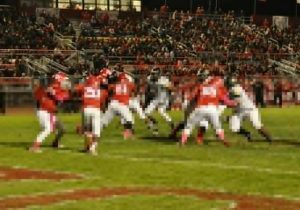 I took over as the Special Teams Coordinator at Oak Hills High School in Hesperia, California in 2014. We had a great season! The best season in a short 6 year history of the school. The Bulldogs won their first Mojave River League Championship, and advanced to the CIF Semi Finals for the first time ever. We ended with an 11-2 record. Our Special Teams improved on 15 of 17 measurable categories. Our kick return was the 5th best unit in the state of California, and our punt return unit had the highest punt return average in the state! 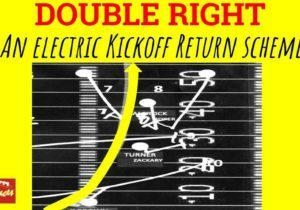 We decreased opponent kick returns for touchdowns by 50 %, decreased opponent average start by 25% (almost 7 yards better! ), and my favorite: increased the Average Start Differential by 2,769%!! Average Start Differential is my favorite Special Teams stat! We improved our Average Start Differential by +8.61 yards. In 2013, our opponent started on an average of +.3 yards better than we did. In 2014, we decreased their average start by 6.18 yards (25% decrease), and increased our average start by 2.13 yards (7% increase). We set 5 new school records: Total kick yards – 4, 229, Punts Inside 20 (we had 7, former record was 2), Field Goals Made, Total Kicking Points, and Punt Returns For Touchdowns. Here is an A-Z list for how to make an impact on Special Teams! Attitude – the number 1 thing that I had to change here at Oak Hills after taking over as the Special Teams Coordinator was their attitude. Most players simply didn’t care about Special Teams. 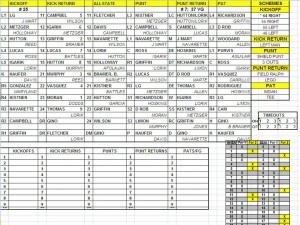 I had to demonstrate to them why Special Teams was so important, and I did that through using stats from the previous year. For instance, they lost by three points to their league rival the year before. And they allowed that rival to start on the 48 yard line while they started on the 24. I explained that they lost 24 yards EVERY single possession of the game, and there were about 8 possessions, this equaled a touchdown at least!! 7 points. I told them all summer “You could have beaten Serrano last year on just having a better kickoff team alone!” You have to change the attitude first and foremost! Buy In! This comes from the top down. If your Head Coach doesn’t have buy in to winning the Special Teams battle, your backups won’t. It comes from the Head Coach, and works its way all the way down the ladder. 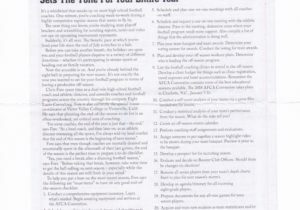 Card – Your game day card is key! 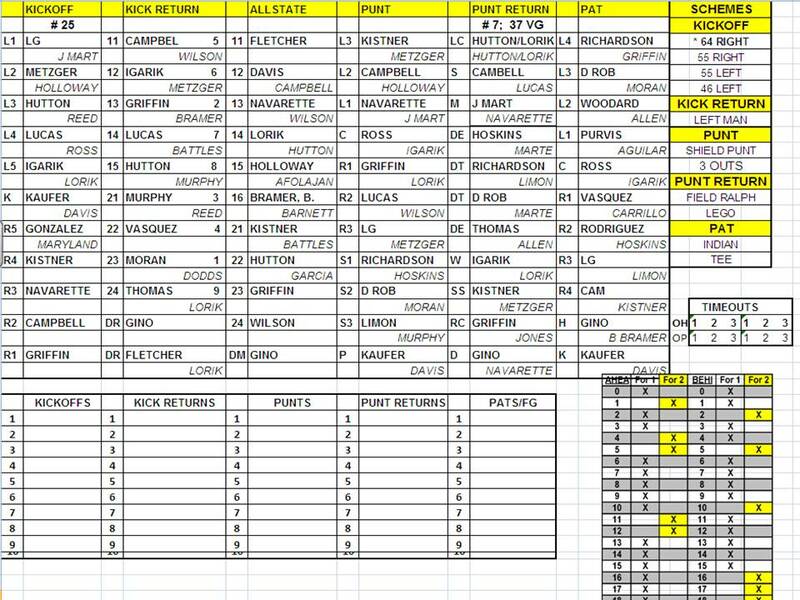 You have got to have an organized Game Day card on it with all of your starting units listed, and who is backing up each of those starters. 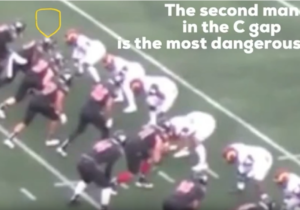 Have your Special Teams plays on that card, have your 2 point chart on that card. Here is a sample of what my card looks like. This is just one of 106 forms from my Outside The Lines Coaching Manual. 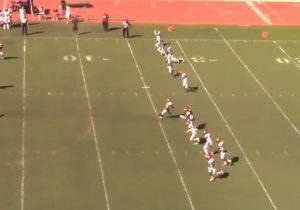 Depth Chart – Your depth chart is KEY to Special Teams success. 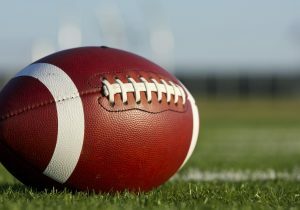 Many coaches at the high school level fail to keep a living/breathing depth chart. I start mine in the Spring, and it changes all summer long, right up until Training Camp where it usually goes through a lot of changes. 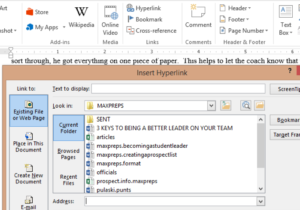 Keep your depth chart live by creating an excel document on your computer, and updating it every time you make a change. There is NOTHING worse than a kid getting injured during the game, you finding out just as the punt team is taking the field, and having to burn a timeout to find someone. Having a depth chart ready to go will help you avoid this situation. Effort – along with Attitude, Effort is HUGE! I said “Attitude and Effort” all of the time. Usually, a lack of attitude = a lack of effort. If kids have a poor attitude in doing something, they will not give you very good effort. Improving the efforts of the kids is key, and the way to do this is through both demanding it and encouraging it. Film, film, film! 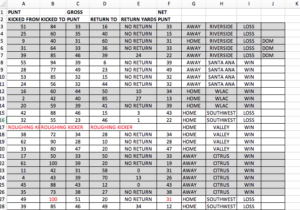 I started my work as the STC at Oak Hills by looking back at every single kick of the previous season. I charted every yard of every kick. This helped me “take the temperature” of the Special Teams units, to know where we needed to start. Goals – I took the average starts of the previous season, and set our game and season goals off of those. For instance, we lost every single Special Teams battle in the area of average start. So, that was our first goal, to have a better average start than our opponents after kickoffs and punts. Without goals, and something to aim for, you’re going to have a hard time challenging your kids. 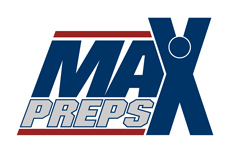 Head Coach – again, it all starts at the top! 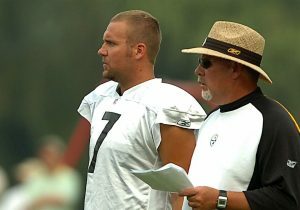 Luckily, our Head Coach here at Oak wanted to make a difference with Special Teams, so he hired a Special Teams Coordinator, someone to specifically lead the way with Special Teams instead of simply splitting up duties between coaches. I’ve been a Head Coach for eight years; I was the STC all 8 years. I highly suggest that! Installation – every Monday we take time to install our schemes for that week if there is something new. This was the KEY to a lot of our success this past season. You have got to take the time to walk through your schemes, just like you do with offense and defense. 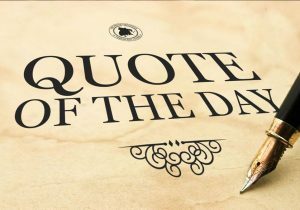 Justify – your kids have to know why you are doing what you’re doing. Justify to them why you are doing what you’re doing. This is key to getting them to buy in to what you’re trying to do. 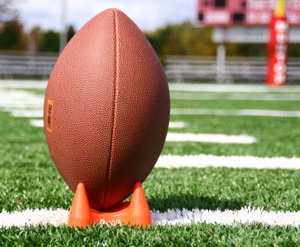 Kickoff team – sets the tone for the whole game. You have got to get in your kid’s mental makeup that the kickoff team has got to be a priority. Here at Oak, our first team kickoff team allowed just two returns for touchdowns this year; down from 5 last year. That’s great improvement. Unfortunately, one of those we allowed was during our Semi Final loss. Use your starters on kickoff team, get your best tacklers out there. The greatest way to make a Special Teams impact is to pin your opponent deep, and make them drive 80 yards, or 90 yards. Live ball!! Know the rules. This year we lost an onside kick during our first game of the year. 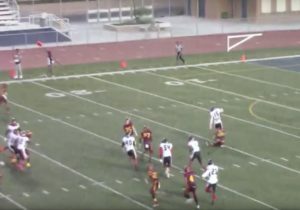 It was on a kickoff following a safety, and the team elected to punt, which they can do. The kicker kicked the ball just about straight up, and it landed on about the 30.5 yard line, then bounced back towards them. Our kids all started backing away from the kicked ball. Most of our staff and sidelines was yelling “peter” which means “get away.” So, there we are running away from the ball as they are recovering it. 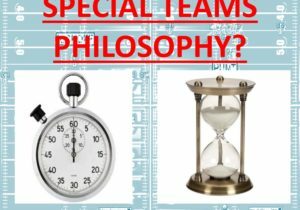 Read my “Misunderstood Special Teams Rules” here. Know the rules, it might just win or lose you a game! Monday – I really believe your most important Special Teams day of the week is Monday! You have the first chance to lay out your game plan to the kids, get your depth chart set, and cast your vision as the Special Teams Coordinator for that week. I like to walk through anything new we have for the week, and walk through any new personnel we are changing up. 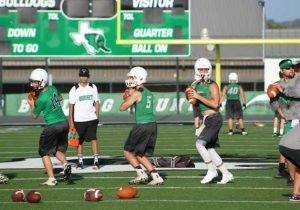 Walk through each of your kicking game plays on Mondays, correct anything from Friday if you didn’t do it with film. Check back for Part 2 very soon! 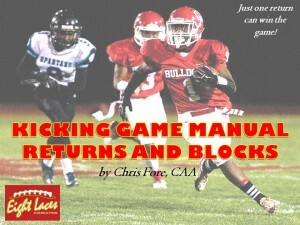 Chris Fore is the Author of Kicking Game Manual: Returns and Blocks. The KICKING GAME MANUAL: RETURNS AND BLOCKS features 28 kick/punt returns, and 7 punt blocks. 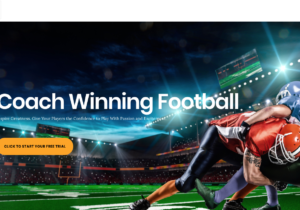 It comes emailed directly to you upon payment in two formats: a 106 page PDF document, and a Power Point ready to teach to your team the returns you want to put in.